Dan Roberts, the Academy of Western Artists reigning Male Vocalist of the Year, is bringing his original style of cowboy western music into the 21st century. His win at the 2000 Academy of Western Artists awards follows on the heels of Billboard magazine calling him "one of today’s up-and-coming performers in the western market." Roberts has turned many an ear towards cowboy western music in the last year with the release of his debut album, ‘There’s A Little Cowboy In All of Us’. His performances at numerous concerts and cowboy gatherings have garnered much support and respect from his fans and cowboy comrades. "Dan Roberts songs are finely crafted and entertaining," says Red Stegall, "Dan is a real American treasure." "There’s A Little Cowboy In All Of Us," produced by Texas Swing legend Tommy Allsup, brought the singer/songwriter full circle to the very heart of the kind of music he loves to write and sing about, pieces of cowboy life. Among his most requested songs are his patriotic tribute to John Wayne and his humorous take on "Horse tradin". His single, "Saddle Pals," is in honor of cowboys who know each other in and out because of the many miles they've traveled together. The song struck a nerve with folks who have been in those same circumstances, riding it to the top of "Rope Burns" magazines western music chart. "Dan Roberts brings a fresh approach to the genre of western music," says Bobby Newton, owner/ publisher of "Rope Burns" magazine. "Although his style is unique, Dan’s music reminds me of the authenticity and originality of Marty Robbins. I would say we have a definite star on the rise." The "star on the rise" moved to Nashville to pursue a career as a song writer after seeing a television show about songwriters and the song writing community in Music City. "I slept in my truck when I first got to town because I didn’t know anyone here," Roberts says with a wry grin. The young man was soon networking within the music community writing with other writers. He started to get a few cuts here and there and met up with another new singer/songwriter in town, Garth Brooks, with whom he often traded original material and cowboy songs around a campfire. After moving to town, Roberts was making his living mainly in construction and by working as a horseshoer. Even though he was writing songs and getting a few cuts in those early years, the music wasn’t taking off for him the way he thought it would and Dan decided to move west and go to work on a cattle ranch. A phone call changed his mind. It seemed Garth was getting ready to write his next album and, remembering Dan’s song writing talents, called to ask if he was interested in writing with him. The move west was postponed and Dan sat down to write with Brooks and songwriter Bryan Kennedy. Together they co-wrote "The Fever," "The Old Stuff," and the song that would turn the corner for Dan, the poignant rodeo cowboy song "Beaches of Cheyenne." It was a chart-topping runaway hit for Brooks, and Garth promptly asked Dan and Bryan to join him on his tour later that year. They were the opening act for 260 shows in 60 cities, playing before more than three million people. They opened more shows for Brooks than any previous opening act. That experience helped Dan hone in on the dream that he had to sing and record cowboy western music. Roberts is steeped in western traditions. He grew up in Oregon, in a family that sang together. By the age of five he was singing four part harmony with the family group, the Melo-Ds. "I have been blessed with a great family," Roberts says, "One that taught me the values of integrity, honesty and hard work. So much of those traits are the traits of the cowboy. The cowboy was and is who I want to be about." With his debut release, Dan’s music caught on quickly and he became very much in demand at cowboy gatherings across the country, including The Santa Clarita Poetry & Music Festival in California and the Lincoln County Cowboy Symposium in Ruidosa, N.M. As a newcomer to cowboy western music, Dan was nominated for the Academy of Western Music’s Rising Star Award as well as "Single of the Year" for "Saddle Pals." The success of his first album prompted him to start writing songs for his second release, "Cowhand.com," released in September 2000. "I love the traditions of cowboy western music, but I’m trying to forge my own style," says Dan. "It’s definitely cowboy music you can dance to. The audience usually starts with a toe tap, but my favorite part is when the music pulls them to the dance floor." 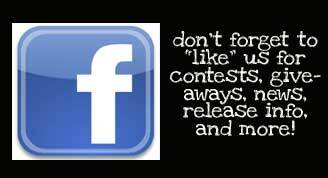 Not only is his music good dance music, but it is seasoned with a bit of humor, as in songs like "Cowhand.com." The title cut takes a humorous look at the adventures of a cowboy who hires onto an outfit that is basically run by computers, not seasoned cowboys. Dan takes the misadventures of this technologically challenged cowboy who longs for the "old days" and turns them into a knee-slapping song. Upon the release of his second album, Roberts and his family (wife Carol, son J.D. and daughters Austin and Maggie) moved to a small ranch west of Fort Worth. "I found myself playing a lot of dates out West and always flying in and out of the DFW airport," Roberts says. "We took a hard look at everything and decided to move to Texas. 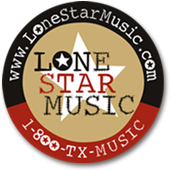 If you’re writing cowboy music, it only makes sense to be in cowboy country, and what better place than the Lonestar State! I believe cowboy/western music could be huge if more people were exposed to it. I’m going to do as much as I can to see that they get that chance." Though his days of riding broncs and bulls are over and his farrier work has dwindled to just shoeing his own horses, Roberts is just as involved in the cowboy way of life as ever. He has taken up team roping and hopes to find time to do a little of that in between heading down the trail to the cowboy gatherings and writing songs about the way of life he knows and loves. Someone once said that real success comes when you are doing absolutely what you want to do in your life. With that statement as a measuring tool, Dan Roberts must surely be one of the most successful people ever to hold a guitar and sing. Dan Roberts is a wonderful singer who portrays the cowboy way of life in all his music. Just thought that those of you who are fans might like to know that he appears with Red Steagall every October at the Red Steagall Cowboy Gathering in Fort Worth. Viva la Cowboy! Love this guys music - lots of western swing. Just wndered why There's a Little Bit of Cowboy...is no available? My first musical hero was Marty Robbins, so I've always had an affinity for western music; QUALITY western music. A couple of years ago I got my hands on my first Dan Roberts CD, and I've been a fan ever since. This genre suffers from a lack of truly talented artists, so I know there'll always be a place for the incredible music of artists like Dan. Keep up the good work, amigo! In the 149th Psalm, the writer encourages, "Let them praise his name with dancing and make music to him with tambourine and harp." But have you ever really wanted to dance to a gospel song? 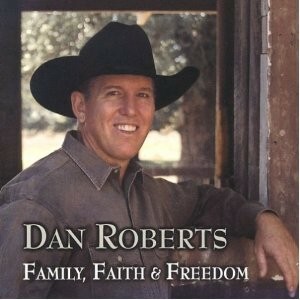 Well, Dan Roberts new release, "Family, Faith & Freedom," may move you to just such reverant merriment. In this generous collection of gospel - and patriotic - classics, I find myself tapping my toe to many an offering. That is especially so with the opening track, a up-tempo, swing version of "Just a Closer Walk With Thee." In this release, Roberts' strong family values are laid open for all to embrace. From the harmony provided throughout the album by his two brothers (who to my knowledge are not professional singers) to the engaging voices of his children and their friends on classics like "Jesus Loves Me" and "This Little Light of Mine," Roberts has amassed a beautiful country gospel album that will delight many. So dance, make music, and sing along as Dan Roberts and his family invite you to worship our Lord in this most uplifting way. 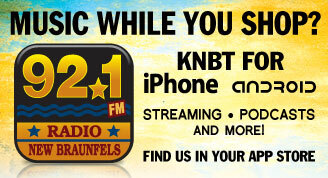 If you love Country Music, you will love Dan Roberts. I have all of his CD's and they are true country. Even the first time you hear them; you will feel like you have been listening forever. I highly recommend "Only in Texas" which is on Viva La Cowboy. It is a great song that keeps you and your beat going! If you are a fan of country music, you owe it to yourself to get your hands on a copy of Dan Roberts' new album, "Viva La Cowboy." The title track is destined to be a classic sing-along favorite, but Dan backs that up with some outstanding covers of Cindy Walker tunes - "Fort Worth, Texas" and "Tucumcari Woman." He includes a clever tribute to George Strait, along with the song he co-wrote with Garth Brooks, "Beaches of Cheyenne." You will want to cut the rug to "Full Moon Turnaround." And your heart will be forever touched when you learn the real story behind "I'm Thinkin' It." At his album release party in Fort Worth in April, Dan opened the evening with the playing of the national anthem and a prayer for our troops. This is the kind of man Dan Roberts is. If you get a chance to dance to Dan and his band, jump on it. Until then, grab the album, available at oldbootsmusic.com. Viva la Cowboy! Just wanted to say how much I enjoyed (There's A Little Cowbow In All Of US) This is a great album, Dan's voice is pure country and the songs are pure Texas. With cut's like Old Cowboy Blues and Saddle Pal, it's got something for everyone. Tommy Allsup, did a great job of producing this record, it's smooth and full. Dan Roberts has a winner.